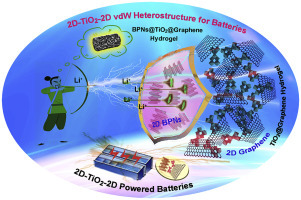 Abstract: Publication date: Available online 18 March 2019Source: Energy Storage MaterialsAuthor(s): Jun Mei, Yuanwen Zhang, Ting Liao, Xiaomin Peng, Godwin A. Ayoko, Ziqi Sun A novel 2D-TiO2-2D van der Waals (vdW) heterostructured (BPNs@TiO2@G) hydrogel is developed as a high-performance anode material for lithium ion batteries by coating black phosphorus nanosheets (BPNs) onto porous graphene/TiO2 composite hydrogel (TiO2@G). This unique 2D-TiO2-2D vdW heterostructure not only prevents close restack between 2D nanosheets, but also provides rapid interlayer transfer paths and enhanced interfacial storage, together with some inherited advantages from 2D BPNs and graphene, such as shortened diffusion pathways, improved conductivity, supressed volume changes and lithium dendrite growth over cycling. As a result, BPNs@TiO2@G anode delivers an attractive initial discharge capacity as high as 1336.1 mAh g−1 (at 0.2 A g−1), a superior rate capability (271.1 mAh g−1 at 5.0 A g−1), and a good cycling life (502 mAh g−1 for 180 cycles) under a potential window close to 3.0 V. This study thus opens a new window for designing novel high-performance electrodes for electrochemical energy storage devices.Graphical abstractA novel 2D-TiO2-2D heterostructured (BPNs@TiO2@G) hydrogel was synthesized by coating black phosphorus nanosheets (BPNs) onto porous graphene/TiO2 composite hydrogel (TiO2@G) as a high-performance anode material for Li+ storage. 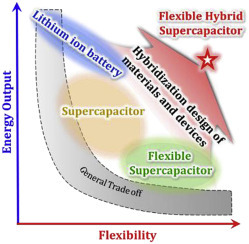 Abstract: Publication date: Available online 18 March 2019Source: Energy Storage MaterialsAuthor(s): Jianjun Luo, Zhong Lin Wang Over the last few decades, tremendous efforts have been focused on developing high performance energy storage systems such as batteries and supercapacitors for the applications in portable devices. However, limited lifetime of these storage systems is still a crucial challenge, meaning inconvenient recharging or replacement is inevitable. Since 2012, a novel technology of triboelectric nanogenerator (TENG) has been proposed for converting tiny mechanical energy into electricity, and various breakthroughs have been achieved for self-powered systems. Integrating TENG with energy storage devices could be a promising way to provide sustainable power supply for long-term operations. In this review article, we present the recent advances in the TENG-based self-charging power systems (SCPSs), which will have significant applications in internet of things, portable electronics, and wearable electronics. Hybrid SCPSs combining other energy conversion technologies are also included. The key approaches for improving the total efficiency of the SCPSs are systematically summarized. Finally, some of the important challenges and future directions to be pursued are also highlighted. 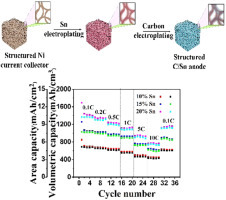 Abstract: Publication date: Available online 14 March 2019Source: Energy Storage MaterialsAuthor(s): Shaohua Wang, Zheng Yi, Xuxu Wang, Qujiang Sun, Yong Cheng, Limin Wang Carbon coated core-shell structured anode has been reported with advantages to enhance conductivity and partly buffer the volume expansion. However, huge mechanical stress and long lithium/sodium transmission distance also hinder the lithium/sodium storage performances. For maximum buffer effect, we herein design a multicore-shell CoSn@C nanocages with decreased particle size and enhanced extra space in comparison with the monocore-shell sample. This unique structure can effectively buffer the volume expansion in the deintercalation process, alleviate electrode pulverization and improve cyclic stability. Electrochemical tests show that multicore-shell CoSn@C nanocubes have excellent discharge capacities of 1010.9 mAh g−1 at 0.5 A g−1 after 160 cycles and 818 mAh g−1 at 1 A g−1 after 300 cycles for lithium ion battery anode, much higher than that of the monocore-shell sample. The sodium storage performance of the multicore-shell CoSn@C is also far more than the monocore-shell one. Above results suggests that fabrication of multicore-shell structure is an excellent design to buffer volume expansion and enhance performance for lithium and sodium storage. Abstract: Publication date: Available online 12 March 2019Source: Energy Storage MaterialsAuthor(s): Ghoncheh Kasiri, Jens Glenneberg, Amir Bani Hashemi, Robert Kun, Fabio La Mantia Aqueous rechargeable metal-ion batteries have become potentially advantageous for the integration of renewable energy sources into the electric power grid thanks to their high rate capability, low cost, environmental friendliness, and intrinsic safety. In this work, we tried to improve the electrochemical stability of CuHCF and prevent/postpone its aging upon cycling. At first we investigated the phase transformation occurring in CuHCF during intercalation of zinc using XRD, SEM and EDX. We observed that large particles are formed upon cycling, which are depleted from copper and are zinc- or iron-rich. In order to prevent this, we modified the CuHCF structure by partially substituting its transition metals with zinc ions during synthesis. We observed that CuZnHCF mixtures with Cu:Zn ratios of 93:7 exhibited an excellent cycle life up to 1000 cycles, with improved specific charge retention with respect to its CuHCF counterpart. Also in the case of CuZnHCF mixtures the formation of large particles upon cycling is observed, but less extended as in pure CuHCF. It appears that different morphologies of the particles show different compositions in term of zinc, iron and potassium. Abstract: Publication date: Available online 12 March 2019Source: Energy Storage MaterialsAuthor(s): Haibo Huang, Feng Zhou, Xiaoyu Shi, Jieqiong Qin, Zhigang Zhang, Xinhe Bao, Zhong-Shuai Wu Rechargeable aluminum ion batteries (AIBs) with low cost and nonflammability have attracted considerable interest for electronics and grid energy storage, however, developing densely-compact cathodes, with rapid ion/electron transport channels and high energy storage capability remains challenging. Herein, we reported the facile construction of the nanoporous densely-stacked films derived from three-dimensional (3D) graphene aerogels, prepared by the self-propagating combustion rapid reduction of graphene oxide aerogels within seconds, as advanced binder-free cathode for ultrafast and high-capacity AIBs. 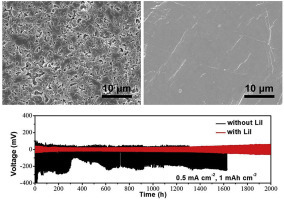 Owing to the notable characteristics of 3D interconnected yet nanoporous structure, large surface area (513 m2 g−1), high electrical conductivity (581 S cm−1), dense stacking (0.61 g cm−3), expanded interlayer spacing (3.69 Å) of graphene aerogel-derived compact film, the as-assembled AIBs deliver considerably high capacity of 245 mAh g−1 at 1 A g−1, at least twice of graphite for AIBs. Impressively, our AIBs display exceptional rate capability, showing 70 mAh g−1 at a high current density of 15 A g−1, coupled with superior cycling stability without obvious capacity decay after 5000 times, and wide temperature operation from 0 to 60 °C, outperforming most reported carbon based cathodes for AIBs.Graphical abstractGraphene aerogel derived compact film is demonstrated as an advanced cathode for ultrafast and high-capacity aluminum ion batteries, with exceptional rate capability, long-term cyclability and wide temperature operation. Abstract: Publication date: Available online 11 March 2019Source: Energy Storage MaterialsAuthor(s): Ruizuo Hou, Girish Sambhaji Gund, Kai Qi, Puritut Nakhanivej, Hongfang Liu, Feng Li, Bao Yu Xia, Ho Seok Park Electrochemical energy storage devices are considered promising flexible energy storage systems because of their high power, fast charging rates, long-term cyclability, and simple configurations. However, the critical issues including low energy density, performance degradation, safety, versatile form factors, and compact device integration should be considered. Herein, we comprehensively review the key aspects of flexible electrochemical energy storage systems with hybrid design from the electrode materials and devices to overcome these impediments and simultaneously achieve both performance and flexibility. We address the fundamental aspects, classification, and design guidelines of flexible hybrid electrochemical energy storage systems in terms of the hybridizations of materials and devices. We finally offer our perspective on the current impediments and future directions to promote continuous innovation and practical application of flexible electrochemical energy storage systems and beyond.Graphical abstractThe key aspects of hybridization design in material and device for flexible electrochemical energy storages are comprehensively reviewed, covering the fundamental aspects, classification, technological advances and limitations, and design guidelines of hybrid systems in terms of materials and devices in detail. The perspective on the potential applications, current impediments and future directions of flexible hybrid energy storage devices is provided to promote continuous innovation. Abstract: Publication date: Available online 9 March 2019Source: Energy Storage MaterialsAuthor(s): Dezhi Kong, Ye Wang, Shaozhuan Huang, Junping Hu, Yew Von Lim, Bo Liu, Shuang Fan, Yumeng Shi, Hui Ying Yang This study reports the design and fabrication of ultrathin zinc-cobalt oxide nanoflakes@N-doped carbon hollow nanowall arrays (ZnCo2O4@NC NWAs) from vertically aligned 2D Co-MOF solid nanowall arrays by controllable cation ion-exchange and post annealing strategies. The unique 3D self-branched nanostructure anchored on flexible carbon textiles (CTs) can offer short ion diffusion length, fast and continuous electron transport pathway, and abundant reaction active sites. More importantly, the rational incorporation of Zn2+ generates hollow structure as well as reduces the intrinsic band gap, which further enhance the ion transportation efficiency and electronic conductivity. 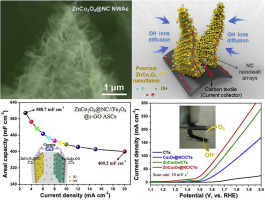 The above superiorities endow the 3D self-branched ZnCo2O4@NC/CTs electrodes with remarkable performances in terms of flexible asymmetric supercapacitor and oxygen electrocatalysis. When evaluated as a flexible cathode for asymmetric supercapacitor, the as-fabricated ZnCo2O4@NC/CTs electrode exhibits outstanding electrochemical performance with a wide work voltage up to 2.0 V, high areal energy density of 0.278 mWh cm−2 (or volumetric energy density of 2.32 mWh cm−3) and long-term cycling stability (∼85.89% capacitance retention over 6000 cycles). Additionally, the ZnCo2O4@NC/CTs electrode shows excellent oxygen evolution reaction (OER) performance with a small overpotential of 196.4 mV at 10 mA cm−2 and long-term durability (over 45 h). This work provides a rational design strategy for controllable synthesis of 3D self-branched hollow nanostructure on flexible substrate for energy storage and conversion applications.Graphical abstract3D self-branched ZnCo2O4@NC hollow nanowall arrays tightly anchored on the flexible carbon textiles have been synthesized by an an ion-exchange, etching and subsequent annealing processes and further investigated as electrode materials for both flexible asymmetric supercapacitors and oxygen electrocatalysis. Abstract: Publication date: Available online 4 March 2019Source: Energy Storage MaterialsAuthor(s): Ajay Jagadale, Xuan Zhou, Rui Xiong, Deepak P. Dubal, Jun Xu, Sen Yang High-performance energy storage devices are extremely useful in sustainable transportation systems. Lithium-ion batteries (LIBs) and supercapacitors (SCs) are well-known energy storage technologies due to their exceptional role in consumer electronics and grid energy storage. However, in the present state of the art, both devices are inadequate for many applications such as hybrid electric vehicles and so on. Lithium-ion capacitors (LICs) are combinations of LIBs and SCs which phenomenally improve the performance by bridging the gap between these two devices. In this review, we first introduce the concept of LICs, criteria for materials selection and recent trends in the anode and cathode materials development. Then, the achievements and prospects associated with LICs are discussed. Finally, we give our recommendations on fabricating anode with hybrid and nanostructured form and cathode with improved capacitive performance. Abstract: Publication date: Available online 1 March 2019Source: Energy Storage MaterialsAuthor(s): Zhuang Sun, Hao-Ran Wang, Jing Wang, Tao Zhang The unsatisfactory stabilities of carbon-based cathodes and lithium anodes are the major hurdles limiting the development of Li-air (O2) batteries. 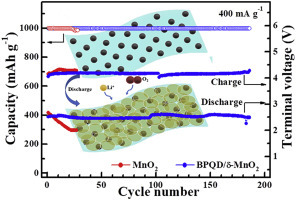 Herein, we propose an extremely simple cell formation process for non-aqueous Li-O2 batteries, by a discharge-charge process in argon prior to O2 atmosphere, to produce protective films on both CNTs-cathode and lithium-anode surfaces. The films are mainly composed of lithium fluoride derived from LiTFSI decomposition and endows lithium oxygen batteries with enhanced cycling stability (>200 cycles) under a consistent capacity condition (1000 mAh g−1). This study reveals that LiF-rich films could effectually suppress the parasitic reactions of electrodes against the reactive intermediates and electrolyte attacks. 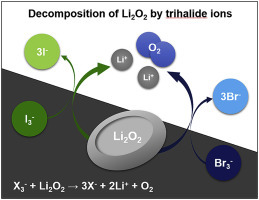 This simple approach provides a new strategy to protect both electrodes for lithium oxygen batteries.Graphical abstractAn extremely simple cell formation process for non-aqueous Li-O2 batteries, by a discharge-charge process in O2-free atmosphere prior to O2 atmosphere, is designed to produce LiF-rich films on both electrodes surfaces. 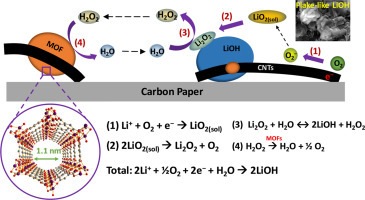 The protective films can significantly suppress the well-known oxidation of CNTs cathode by reduced oxygen species and severe corrosion of Li metal anode upon cycling for improved stability in Li-O2 batteries. Abstract: Publication date: Available online 28 February 2019Source: Energy Storage MaterialsAuthor(s): Liangxu Lin, Wen Lei, Shaowei Zhang, Yuqing Liu, Gordon G. Wallace, Jun Chen Supercapacitors and secondary batteries are indispensable and widely used energy storage components in modern electrical and electronic facilities/devices. However, they both suffer from different technical weaknesses which need to be thoroughly addressed to satisfy the increasing demand for clean energy technologies. For many years efforts to overcome these technical challenges have reached their practical limits, but recent progress on two dimensional (2D) materials, such as thin transition metal dichalcogenides (TMDs), has been considered more encouraging. Owing to their thin and flexible aspects, large electrochemical active surface area (EASA), high surface tunability, rich coordination sites, and both “Faradaic” and “Non-Faradaic” electrochemical behaviours, 2D TMDs play particular roles in improving many aspects of energy storage devices. This concise review summarizes current challenges facing both supercapacitors and secondary batteries, and discusses how 2D TMDs can be utilized to improve their performance. Building on their thin and flexible features, we further discuss how the emerging flexible and thin energy storage devices can benefit from the 2D TMDs, and make suggestions as to how these 2D TMDs can be engineered for future energy storage applications. Abstract: Publication date: Available online 23 February 2019Source: Energy Storage MaterialsAuthor(s): Haosen Wang, Ziwei Yu, Maher F. El-Kady, Mackenzie Anderson, Matthew D. Kowal, Mengping Li, Richard B. Kaner Carbon-based supercapacitors exhibit great rate capability, power density and cycle life, but suffer from relatively low energy density. Polyaniline provides high specific capacitance, but lacks cycling stability. By combining carbon-based materials with tetraaniline, an oligomer of polyaniline, a hybrid composite is formed that demonstrates improved supercapacitor performance relative to either material alone. In this study, the reduced graphene oxide-oligoaniline composites have been synthesized by a one-step hydrothermal process without the need for adding any oxidizing or reducing agents. FTIR, Raman spectroscopy, XPS, and MALDI-TOF mass spectroscopy indicate the successful reduction of GO to rGO and the formation of aniline oligomers. Unlike most polyaniline nanostructures for which charge storage kinetics are limited by slow diffusion-controlled reactions, the majority of oligoaniline in this composite is exposed to the electrolyte and stores charge through fast surface-controlled reactions. The unique microstructure of the rGO-oligoaniline composites facilitates transport of ions and electrons, leading to greater utilization of the active materials, high specific capacitance of 640 F/g at 0.2 mA/cm2 (corresponding to 707 C/g specific capacity), great rate capability and good cycle stability (91% retention after 2000 cycles). Abstract: Publication date: Available online 21 February 2019Source: Energy Storage MaterialsAuthor(s): Xiangjun Pu, Huiming Wang, Tianci Yuan, Shunan Cao, Shuangyu Liu, Li Xu, Hanxi Yang, Xinping Ai, Zhongxue Chen, Yuliang Cao Sodium-ion battery is regarded as a promising power source for large-scale energy storage systems. However, the development of sodium-ion batteries is hindered by the lack of applicable cathode materials with low cost and long cycle life. 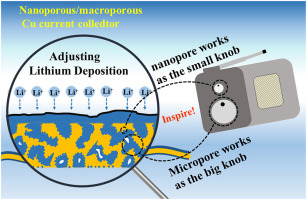 Here, we report a successful synthesis of Na4Fe3(PO4)2P2O7/C nanospheres with tunable particle size and carbon coating thickness by a template approach. The as-prepared Na4Fe3(PO4)2P2O7/C nanospheres deliver a high discharge capacity of 128.5 mAh g−1 (near to the theoretical capacity: 129 mAh g−1) at 0.2C, with capacity retention of 63.5% at 10 C after 4000 cycles. Particularly, a high reversible capacity of 79 mAh g−1 is exhibited at an ultrahigh current rate of 100 C (charge/discharge in 36s). The excellent performances result from the shortened Na+ ion diffusion length within the nanospheres (∼30 nm) and highly conductive pathways for electrons in the carbon coating layers (∼3 nm). 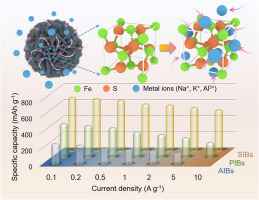 Owing to their low cost, long lifespan and outstanding rate capability, we believe that the Na4Fe3(PO4)2P2O7/C nanospheres are considerable competitive to other cathode materials for application in stationary sodium-ion batteries. 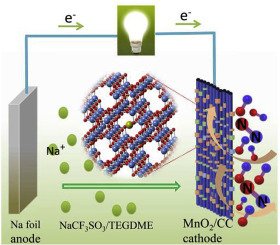 Abstract: Publication date: Available online 20 February 2019Source: Energy Storage MaterialsAuthor(s): Feng Wu, Jiahui Zhou, Rui Luo, Yongxin Huang, Yang Mei, Man Xie, Renjie Chen Sodium (Na) metal has attracted great attention as a promising anode for next-generation energy storage systems because of its abundant resources, potentially low cost, and high theoretical capacity. However, severe dendrite growth, large volume expansion during plating/stripping lead to poor cycle performance and limit the practical application of sodium metal anodes. 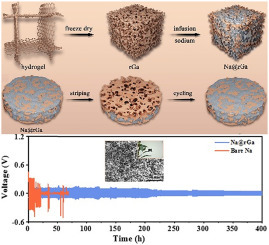 Here, oriented freeze-drying and molten infusion are used to synthesize a Na-infused reduced graphene oxide aerogel (Na@rGa) composite anode using a reduced graphene oxide aerogel (rGa) as a stable host. This unique host shows ultra-light weight which guarantees high capacity (1064 mAh g−1), and the large specific surface area and uniform pores effectively lower the local current density and uniform electrolyte distribution from the inner to the outside of electrode. The Na@rGa anode exhibits low overpotential (50 mV) and stable cycle performance for 1000 cycles at 5 mA cm−2 in carbonate electrolyte system. The electrochemical performance of a full cell using the Na@rGa composite anode is clearly superior to that of a reference cell. This work provides a new horizon for construction of three-dimensional stable hosts and safe sodium metal anodes.Graphical abstractOriented freeze-drying was used to produce a uniform pores and ultra-light graphene aerogel (1.75%wt of the whole composite anode) as host for dendrite-free Na metal anode. Uniform pores of aerogel host assure uniform Na nucleation, and effectively reduces the local current density. Composite anode shows low overpotential and stable cycle performance in carbonate electrolyte system without any additives and superior electrochemical performances in full cell. Abstract: Publication date: Available online 20 February 2019Source: Energy Storage MaterialsAuthor(s): Jiang Xu, Ningyi Yuan, Joselito M. Razal, Yongping Zheng, Xiaoshuang Zhou, Jianning Ding, Kyeongjae Cho, Shanhai Ge, Ruijun Zhang, Yury Gogotsi, Ray H. Baughman Building supercapacitors that can provide high energy density over a wide range of temperatures, where traditional energy storage devices fail to operate, requires tailoring of electrolyte and/or electrode material. Here, we show that record gravimetric capacitances of 164 and 182 F g−1 can be attained at −100 and 60 °C, respectively, nearly equivalent to the room-temperature value of 177 F g−1, when activated carbon-based electrodes with predominantly slit-shaped micropores and a low freezing-point electrolyte are used. Experimental data and density functional theory calculations suggest that electrode material characteristics, such as pore size and shape, matched with the effective size of partially solvated ions of the electrolyte, are the key factors in achieving such performance. This study provides evidence for the effective design of robust supercapacitors with sustained performance at both low and high temperatures. Abstract: Publication date: Available online 15 February 2019Source: Energy Storage MaterialsAuthor(s): Weiqin Chu, Xu Zhang, Jie Wang, Shu Zhao, Shiqi Liu, Haijun Yu Aluminum-sulfur (Al-S) battery is a promising candidate of next generation rechargeable batteries owing to its high theoretical energy density, high safety and low cost, but currently greatly impeded by the shortage of high-performance and cost-effective electrolytes. In this work, a low-cost deep eutectic solvent, i.e., AlCl3/acetamide, as the electrolyte for reversible room-temperature Al-S battery has been reported. The Al-S battery delivers an initial capacity above 1500 mA h g−1 and good rate performance, which is most probably caused by the presence of AlCl4−, Al2Cl7− and [AlCl2·(acetamide)2]+ ions as indicated by spectroscopic analysis. Furthermore, X-ray photoelectron spectroscopy on the discharged sulfur cathode suggests the presence of aluminum sulfides including Al2S3 as electrochemical conversion products. Density functional theory calculations on the energy barriers provide insights into the electrochemical reaction pathways. This AlCl3/acetamide based Al-S battery presents a promising prospect for high-performance and low-cost energy storage system in future. Abstract: Publication date: Available online 14 February 2019Source: Energy Storage MaterialsAuthor(s): Kai Zheng, Yinxiang Zeng, Si Liu, Chenghui Zeng, Yexiang Tong, Zhikun Zheng, Tingshun Zhu, Xihong Lu Designing high-energy and durable negative electrode materials is highly desirable for advancing the performance of asymmetric supercapacitors (ASCs). The feasibility of vanadium oxides (VOx) as negative electrodes in ASCs has been revealed, but most of them suffered from fast capacitance fading. Additionally, achieving high areal capacitance and gravimetric capacitance for an electrode simultaneously is very challenging. 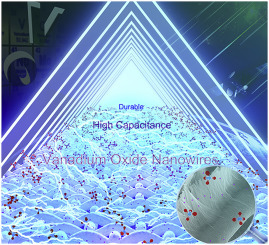 In this work, we solve well these issues through introducing low-valence-state V3+ and phosphate ions into vanadium oxides (PVO) nanowires by a simple and innovative strategy, which exhibits unprecedented capacitive properties and long-term stability in negative potential window. Because of the dramatically increased active sites, improved electrochemical reversibility, enhanced electron and Li+ ion transport rates, the as-prepared PVO electrode delivers ultrahigh areal and gravimetric capacitances of 1.57 F/cm2 and 1652.3 F/g at 2 mA/cm2. Furthermore, an impressive cyclic durability of 20000 cycles (almost 100% retention) is obtained for the PVO electrode, substantially superior to the untreated vanadium oxide electrode (22.8% retention). When employing this PVO as a negative electrode, a 1.8 V-flexible and stable ASC device with an admirable energy density of 1.93 mWh/cm3 is achieved.Graphical abstractValence- and surface-tuned vanadium oxide (PVO) nanowires have been demonstrated as a new high-energy and durable negative electrode for flexible asymmetric supercapacitors. The optimized PVO electrode could achieve exceptionally high areal capacitance and gravimetric capacitances of 1.57 F/cm2 and 1652.3 F/g at 2 mA/cm2 as well as unprecedented cyclic stability. Furthermore, a 1.8 V-flexible and stable ASC device with an admirable energy density of 1.93 mWh/cm3 is also obtained based on this PVO negative electrode. Abstract: Publication date: Available online 14 February 2019Source: Energy Storage MaterialsAuthor(s): Jian-Long Xu, Yan-Hua Liu, Xu Gao, Su Shen, Sui-Dong Wang Wide applications of smart wearable electronics have triggered tremendous needs for energy storage devices featuring lightweight, transparency, foldability and breathability. However, conventional supercapacitor electrodes are always substrate-supported with a compact film structure, which strongly limits their air permeability, flexibility and transparency. In this report, we demonstrate the use of a freestanding, ultrathin (∼ 6 μm), highly conductive (4 × 105 S/m), highly transparent (> 91%), air permeable (2600 mm/s at 10 Pa) and foldable metallic mesh electrode, decorated with active MnO2 microstructures, as a breathable, transparent and foldable supercapacitor electrode. 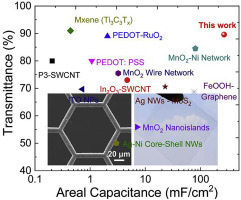 By introducing Au nanoparticles as the “nanoglue” between Ni and MnO2, excellent electrochemical performances including large areal capacitance (268 mF/cm2) and high cycling stability (90.1% capacitance retention after 10000 cycles) are obtained in the MnO2-Au-Ni mesh electrode. Furthermore, the assembled all-solid-state supercapacitor device delivers high optical transparency (∼83.6%), high air permeability (45.4 mm/s at 100 Pa), superior electrochemical performances and can withstand various deformations including bending, folding, and crumpling. The present freestanding mesh structure electrode could be further explored and applied in more potential applications, such as ion batteries, wearable sensors, and conformal healthcare devices.Graphical abstractUltrathin, lightweight and freestanding mesh electrodes with outstanding breathability, transparency and foldability are successfully designed and fabricated by a simple and low-cost method. The electrode obtained by such freestanding mesh structures exhibits both excellent capacitive performance and high optical transparency, based on which high-performance, breathable, transparent and foldable all-solid-state supercapacitors are constructed. Abstract: Publication date: Available online 14 February 2019Source: Energy Storage MaterialsAuthor(s): Shude Liu, Ying Yin, Dixing Ni, Kwan San Hui, Ming Ma, Sewon Park, Kwun Nam Hui, Chu-Ying Ouyang, Seong Chan Jun Anion doping and oxygen-defect creation have been extensively employed to modify the electronic properties and increase concentration of electrochemically active sites of electrode materials for electrical energy storage technologies; however, comprehensive study of the roles of anion doping and oxygen vacancy on the enhancement of electrochemical performance is not clear. Herein, we provide new insight into the effect of fluorine dopant and oxygen vacancy on electrochemical performance of fluorine-doped oxygen-deficient Co2MnO4 (F-Co2MnO4-x) nanowires grown on carbon fiber (CF) as advanced electrode materials for supercapacitor. An experimental and theoretical study reveals that the structural and electronic properties in F-Co2MnO4-x is effectively tuned by introducing F dopants and oxygen vacancies, synergistically increasing electrical conductivity and providing rich Faradaic redox chemistry. The resultant F-Co2MnO4-x achieves a high specific capacity of 269 mA h g−1 at 1 A g−1, and superior cyclic stability with 93.2% capacity retention after 5000 cycles at 15 A g−1. 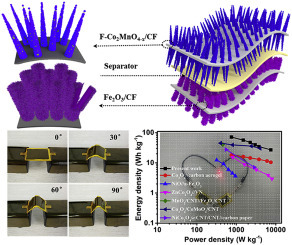 A flexible quasi-solid-state asymmetric supercapacitor (ASC) is constructed with F-Co2MnO4-x/CF as the positive electrode and Fe2O3/CF as the negative electrode. The ASC device exhibits a high energy density of 64.4 W h kg−1 at a power density of 800 W kg−1. Significantly, the device yields 89.9% capacitance retention after 2000 bending tests at a bending angle ranging from 0 to 30°, demonstrating the high integration of excellent mechanical flexibility and cycling stability.Graphical abstractFluorine-doped oxygen-deficient Co2MnO4 nanowires were fabricated on a flexible carbon fiber for use as electrode materials for supercapacitor. Experimental and theoretical studies provide new insight on the effect of the introduced F dopant and O vacancies on electrochemical performance of F-Co2MnO4-x. Flexible quasi-solid-state asymmetric supercapacitors comprising the F-Co2MnO4-x as the positive electrode material and Fe2O3 as the negative electrode material achieve high energy density of 64.4 W h kg−1 at a power density of 800 W kg−1, and highly integrative features with excellent cycling performance and mechanical flexibility (89.9% retention of the initial capacitance at 10 mV s−1 after 2000 bending cycles with an angle ranging from 0 to 30°). Abstract: Publication date: Available online 13 February 2019Source: Energy Storage MaterialsAuthor(s): Yun-Jung Kim, Sung Hyun Kwon, Hyungjun Noh, Seongmin Yuk, Hongkyung Lee, Hyun soo Jin, Jinhong Lee, Ji-Guang Zhang, Seung Geol Lee, Hwanuk Guim, Hee-Tak Kim Fabricating a uniform thin-film Li metal anode on a heterogeneous Cu substrate is a critical step toward high energy density lithium metal batteries. Here, we explore a facet selective lithium (Li) nucleation and growth phenomenon on copper (Cu) substrate and demonstrate that controlling the facet structure can improve the uniformity in electro-deposition of Li and the electrochemical performances of the resulting thin Li electrode. Preferential Li deposition on the Cu(100) plane is demonstrated by electrochemical analysis of the Cu single crystal surfaces and by electron-backscatter diffraction analysis of the Li-deposited Cu surfaces. DFT calculations show that a difference in the Li adsorption energy among the Cu facets during the initial Li deposition process is responsible for the facet selectivity. 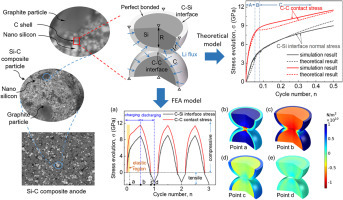 A majorly (100) plane-orientated Cu foil fabricated by a simple annealing method exhibits more uniform Li nucleation and leads to a 10-fold higher nuclei density and a two-fold enhancement in the Li cycling stability compared with a conventional Cu foil with randomly oriented surface facets. The control of the surface facet provides a new design principle for the thin-film Li metal anode used in lithium metal batteries.Graphical abstractOur research investigates the selective Li deposition behavior on Cu(100) plane rather than other Cu planes by various and detailed analyses. Based on this phenomenon, we further demonstrate that the majorly (100) plane-orientated Cu foil exhibits more uniform Li deposition on it with lower nucleation energy, which resulting in a two-fold enhancement in the Li cycling stability compared with using a conventional Cu foil with randomly oriented surface facets. Abstract: Publication date: Available online 5 February 2019Source: Energy Storage MaterialsAuthor(s): Qinjun Shao, Zhong-Shuai Wu, Jian Chen Lithium-sulfur (Li-S) batteries are recognized as one of the most promising advanced energy storage systems due to high energy density, inexpensive and environmentally friendly elemental sulfur. 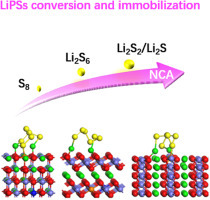 However, the actual applications of Li-S batteries have been intrinsically plagued by capacity fading and low Coulombic efficiency mainly derived from the severe shuttle effect of lithium polysulfides (LiPSs). Recently, two-dimensional (2D) materials have been extensively explored to enhance the performance of Li-S batteries because of their unique 2D structure and diversified physicochemical properties. In this review, we summarized the state-of-the-art advances of 2D materials for advanced high-energy Li-S batteries. To specify their applications, we first overviewed various 2D materials (e.g. graphene, oxides, sulfides, carbides, nitrides) serving as insulating sulfur hosts with high surface area, excellent electrical conductivity and enriched functionality, to significantly buffer the volumetric variation and reduce the pulverization of the active sulfur, and boost the sulfur utilization and the improvement of cycle stability. Second, 2D materials with large lateral size, controllable interspaces, and enriched catalytic sites were good choices for separators and interlayers, which can efficiently prevent the diffusion and migration of the dissolved polysulfides via physical confinement and chemical interaction, revealing the synergistic effects for suppressing shuttle effect and stabilizing high performance. Besides, the 2D nanosheets-based interlayers and separators also contributed to prevent lithium anode from side reaction with LiPSs. 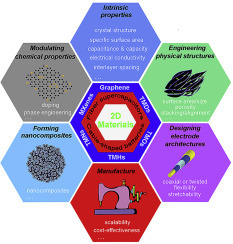 Third, graphene and their analogues can act as the integrated interfacial layer and host of lithium metal, and effectively restrain the growth of lithium dendrite and guarantee the prolonged lithium stripping/plating. 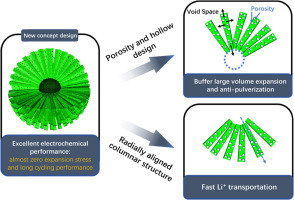 Particular emphases are given to the unique structures, interfacial interactions, strategies for ingenious assembly and innovations of configuration in Li-S batteries. Finally, the remaining challenges and perspectives of Li-S batteries using 2D materials are briefly discussed. Abstract: Publication date: Available online 5 February 2019Source: Energy Storage MaterialsAuthor(s): Marcus Fehse, Antonella Iadecola, Moulay Tahar Sougrati, Paolo Conti, Marco Giorgetti, Lorenzo Stievano In the last decade, a rapidly growing number of operando spectroscopy analyses have helped unravelling the electrochemical mechanism of lithium and post-lithium battery materials. The corresponding experiments usually produce large datasets containing many tens or hundreds of spectra. This considerable amount of data is calling for a suitable strategy for their treatment in a reliable way and within reasonable time frame. To this end, an alternative and innovating approach allowing one to extract all meaningful information from such data is the use of chemometric tools such as Principal Component Analysis (PCA) and multivariate curve resolution (MCR).PCA is generally used to discover the minimal particular structures in multivariate spectral data sets. In the case of operando spectroscopy data, it can be used to determine the number of independent components contributing to a complete series of collected spectra during electrochemical cycling. The number of principal components determined by PCA can then be used as the basis for MCR analysis, which allows the stepwise reconstruction of the “real” spectral components without needing any pre-existing model or any presumptive information about the system.In this paper, we will show how such approach can be effectively applied to different techniques, such as Mössbauer spectroscopy, X-ray absorption spectroscopy or transmission soft X-ray microscopy, for the comprehension of the electrochemical mechanisms in battery studies. Abstract: Publication date: Available online 4 February 2019Source: Energy Storage MaterialsAuthor(s): Haiyue Yang, Weixiang Chao, Siyuan Wang, Qianqian Yu, Guoliang Cao, Tinghan Yang, Feng Liu, Xin Di, Jian Li, Chengyu Wang, Guoliang Li High efficient energy storage devices for both thermal energy and light energy are scarce in the development of modern society to reduce energy consumption. In this work, a novel self-luminous wood composite based on phase change materials (PCMs) with superior thermal energy storage and long afterglow luminescence (LAL) materials with excellent light energy storage is reported. The obtained self-luminous wood composites shows high latent heat of fusion (146.7 J g-1), suitable phase change temperature at about 37 ℃, favorable thermal reliability and thermal stability below 105 ℃ with excellent shape-stability. More importantly, the self-luminous wood composites can absorb ultraviolet and visible light from lighting source and natural light, and emit green light in the dark for 11 h. More interesting, the addition of LAL particles can improve the thermal conductivity of self-luminous wood composites. All results demonstrate self-luminous wood composites can store both thermal energy and light energy, and have great potential in applications including furniture, emergency light, storage and building energy conservation. Abstract: Publication date: Available online 2 February 2019Source: Energy Storage MaterialsAuthor(s): Liyi Zhao, Jing Yu, Chitian Xing, Zaka Ullah, Congcong Yu, Shoupu Zhu, Mingliang Chen, Weiwei Li, Qi Li, Liwei Liu Anthraquinone (AQ), as organic cathode material, has provided an excellent opportunity to update the preexisting energy storage technologies owing to its facile and desirable fabrication at molecular level, higher theoretical gravimetric capacities and remarkable sustainability. However, some of its pristine properties like insulation and dissolution into electrolyte of organic active materials during cycling, have been inevitable obstacles to boost its electrochemical performance. 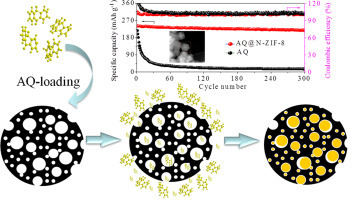 Herein, we report a rational strategy to improve lithium ion storage performance of AQ by confining nanosized amorphous AQ into zeolitic imidazolate framework-8 (ZIF-8)-derived nitrogen-doped microporous carbon scaffold (AQ@N-ZIF-8). The AQ@N-ZIF-8 cathode delivers a high reversible specific capacity of 240 mAh g−1 at current rate of 0.1 C and retains ~216 mAh g−1 after 300 cycles (remarkably low capacity fading rate of 0.08% per cycle) with coulombic efficiency up to 99%. 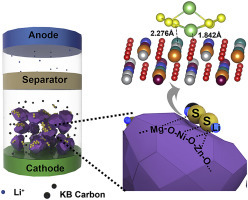 The exceptional lithium ion storage capacity of AQ@N-ZIF-8 is mainly ascribed to the synergistic effect of high loading capacity of AQ encapsulation and nanopore confinement of AQ dissolution in carbon scaffolds, and the enhanced conductivity of the encapsulated AQ by higher contents of nitrogen dopant. 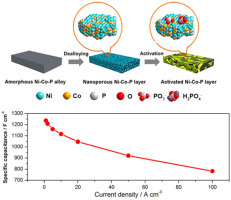 Moreover, the N-ZIF-8 with micropores facilitates the fast diffusion of organic electrolyte ions.Graphical The AQ/MOF-derived carbon materials based cathode is designed and fabricated for significant application in the organic lithum-ion batteries. Abstract: Publication date: February 2019Source: Energy Storage Materials, Volume 17Author(s): Wenwen Xu, Zhiyi Lu, Tianyu Zhang, Yiren Zhong, Yueshen Wu, Guoxin Zhang, Junfeng Liu, Hailiang Wang, Xiaoming Sun Rechargeable zinc air batteries (ZABs) have gained considerable attention as a promising energy technique recently owing to their high theoretical energy and power density, safety and economic viability; however, the state-of-art ZABs have been plagued by two major drawbacks, unsatisfying achievable power density and low voltage efficiency. Our superwetting electrodes are hereby designed to circumvent these issues through controlling the O2 bubbles adsorption/evolution behavior at electrode surface while maintaining the outstanding electrocatalysis performance. In this work, we demonstrate for the first time the application of superwetting catalytic electrodes in the tri-electrode rechargeable ZABs. 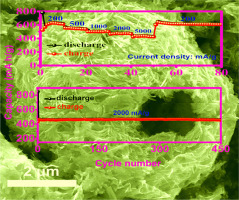 Two different functional electrodes, namely superaerophilic cobalt-incorporated nitrogen-doped carbon nanotubes hybrid catalyst and superaerophobic NiFe-layered double hydroxide arrays, serve as exceptional catalysts for discharging and charging process respectively, thus achieving superior battery performance. The low-cost superwetting cathode pairs even exhibit a much better catalytic activity and durability than the combination of precious Pt/C and Ir/C catalysts. The as-assembled ZABs deliver a greatly improved peak power current of 245 mW cm−2 at 396 mA cm−2 over that of the ZABs composed of precious metal electrodes (186 mW cm−2), together with small polarization, high reversibility, and stability over long cycles. The design of superwetting electrode marks a general and effective strategy to achieve high-performance rechargeable ZABs. Abstract: Publication date: February 2019Source: Energy Storage Materials, Volume 17Author(s): Shang-Sen Chi, Yongchang Liu, Ning Zhao, Xiangxin Guo, Ce-Wen Nan, Li-Zhen Fan Garnet electrolyte-based lithium (Li) metal batteries, which employ garnet-type Li7La3Zr2O12 (LLZO) as electrolyte and Li metal as anode, are regarded as a promising candidate for high-energy batteries. However, Li dendrites formation as well as poor solid-solid contact between the electrolyte and electrodes result in high interfacial resistance, large polarizations, and low Coulombic efficiency. 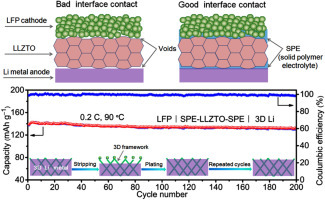 Herein, we demonstrated that solid polymer electrolyte (SPE) soft interface layer deposited on garnet electrolyte (Ta-doped LLZO (LLZTO)) surface along with 3D Li metal anode can address these obstacles. 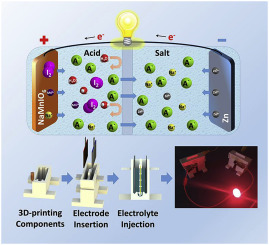 In this architecture, SPE layer was deposited on garnet electrolyte surface to endow connected interface between the electrolyte and electrodes and thus settled the interface contact issue. 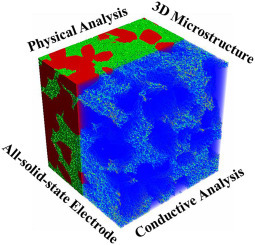 3D Li metal anode can accomplish dendrite-suppression by increasing Li ions deposition sites to lower the effective current density and render a uniform Li nucleation with 3D frameworks. With this ingenious arrangement, the solid-state 3D Li︱SPE-LLZTO-SPE︱3D Li symmetrical cell exhibits a stable voltage profile over 700 h and solid-state LiFePO4︱SPE-LLZTO-SPE︱3D Li full cell also shows an extremely superior cyclability and high Coulombic efficiency even at 90 °C. 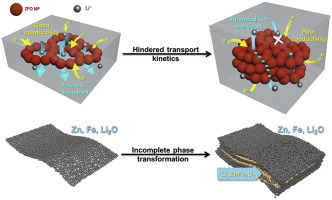 This work provides an alternative option for manufacturing safe and stable solid-state Li metal batteries.Graphical abstractSolid polymer electrolyte (SPE) soft interface layers with 3D Li metal anode are directly assembled in garnet LLZTO-based solid-state battery. 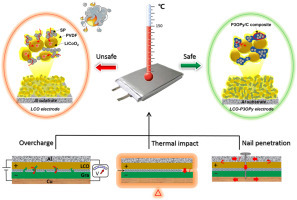 Benefiting from the cooperation of SPE interface layer's enhancement to solid-solid contact together with 3D Li metal anode to suppress dendrite growth, an excellent electrochemical performance could be achieved in solid-state Li metal battery at 90 °C. Abstract: Publication date: February 2019Source: Energy Storage Materials, Volume 17Author(s): Hong Zhang, Xuanhe Hu, Yi Zhang, Shuangyin Wang, Fei Xin, Xudong Chen, Dingshan Yu Lithium-sulfur (Li-S) batteries with traditional PVDF binders suffer from low active material utilization, poor cycling stability and low sulfur loading, which remarkably hinders their practical application. To address these issues once for all, we developed a three-in-one multifunctional binder based on three-dimensional (3D)-crosslinked tannic acid (TA)/poly(ethylene oxide) (PEO) complex, wherein TA can drastically enhance the stability of PEO in electrolyte solution. As-designed TA/PEO binder integrates multiple functions in one material: (1) greatly retard the shuttle effect, (2) effectively maintain cathodes integrity, (3) improve lithium ions transfer capacity, yet this point is often ignored in many existing binders. Benefiting from the above merits, even with a simple sulfur/carbon composite as cathode materials as a proof-of-concept, the assembled Li-S batteries using the TA/PEO binder present a discharge capacity of 476.7 mA h g−1 over 1000 cycles at 0.2 C, much higher than that with the PVDF binder (only 30 mA h g−1). The corresponding capacity fade is approximately 0.03%, superior to most reported binders. Even at a high sulfur loading of 5.0 mg cm−2, the cell delivers a capacity retention of 74.5% over 150 cycles. Additionally, the cathode preparation using our TA/PEO binder is an aqueous process, making it particularly promising for large-scale manufacturing.Graphical abstractA three-in-one multifunctional binder based on 3D-crosslinked tannic acid (TA)/poly(ethylene oxide) (PEO) complex was synthesized via an aqueous and easy-to-scale up process, which not only functions as a highly adhesive agent, but also effectively retards the shuttle effect, maintains cathodes integrity and improves lithium ions transfer, thus leading to high-sulfur-loading and high-stability Li-S batteries. Abstract: Publication date: February 2019Source: Energy Storage Materials, Volume 17Author(s): Gaozhan Liu, Dongjiu Xie, Xuelong Wang, Xiayin Yao, Shaojie Chen, Ruijuan Xiao, Hong Li, Xiaoxiong Xu A series of new solid electrolytes of Li3+3xP1-xZnxS4-xOx (x = 0.01, 0.02, 0.03, 0.04, 0.05, 0.06) are synthesized successfully via Zn, O co-doping the Li3PS4 glass-ceramic for the first time. 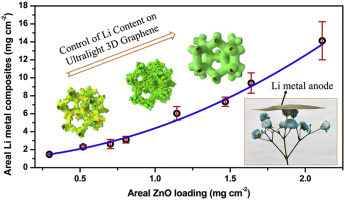 The result shows that Li3PS4 aliovalent substitution of 2 mol% ZnO (Li3.06P0.98Zn0.02S3.98O0.02) presents the highest conductivity of 1.12×10−3 S cm−1 at room temperature, which is twice that of the pristine Li3PS4. Besides, Li3.06P0.98Zn0.02S3.98O0.02 exhibits excellent stability against humid air, lithium metal and chlorobenzene solvent. The mechanisms of the enhancement of conductivity and air-stability are well understood by conducting first-principles density functional theory (DFT) calculation and Bond-Valence (BV) analysis, and the results well demonstrate that the conductivity and air-stability of Li3PS4 could be improved via Zn, O dual-doping, in which partial P5+ could be substituted by Zn2+, and a part of S2- could be replaced by O2-. Finally, the all-solid-state lithium battery (ASSLB) with bi-layer electrolytes of LiCoO2/Li10GeP2S12/Li3.06P0.98Zn0.02S3.98O0.02/Li is assembled, and it delivers an initial discharge capacity of 139.1 mAh g−1 at 0.1 C and a capacity retention of 81.0% after 100 cycles at room temperature. 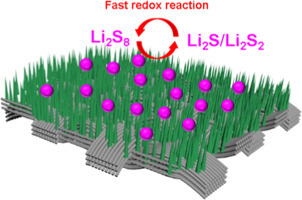 This work combines systematical experimental characterizations and sufficient theoretical calculations to develop a new promising sulfide electrolyte with superior lithium ion conductivity and high air-stability for ASSLBs application. Abstract: Publication date: February 2019Source: Energy Storage Materials, Volume 17Author(s): Xuejun Liu, Tao Qian, Jie Liu, Mengfan Wang, Hongli Chen, Chenglin Yan The development of lithium sulfur (Li-S) batteries has provided a popular alternative to the current state-of-art battery technologies because of their low cost as well as high theoretical specific energy. However, it is still challenging to develop sulfur cathodes with high Coulombic efficiency due to the polysulfide dissolution problem. Herein, we present a new strategy to improve the Coulombic efficiency by using nitryl grafted sulfur cathode, which is confirmed by in-situ XRD measurement and XPS analysis. The formed SEI layer on the nitryl grafted sulfur cathode could effectively trap the soluble polysulfide and avoid polysulfide migration from cathode into electrolyte, which allows significant improvement in the capacity retention of 80.6% after 450 cycles. In addition, a Coulombic efficiency of ~ 100% is achieved for the nitryl grafted sulfur (Nitryl-S) cathode, which is superior to the value of bare S cathode. The excellent performance is owing to the significantly reduced concentration of soluble polysulfide as evidenced by in-situ UV/Vis spectroscopy analysis. Thus this strategy might open up a new avenue for practical application of Li-S batteries. Abstract: Publication date: February 2019Source: Energy Storage Materials, Volume 17Author(s): Yu Zhang, Yong Xu, Yongjun Ji, Xi Wang, Jing Li, Hezhi Liu, Dingsheng Wang, Ziyi Zhong, Yoshio Bando, Fabing Su Huge volume expansion and structural degradation of transition-metal oxide electrode materials upon cycling often lead to severe capacity fading in lithium ion batteries (LIBs). To overcome these technical barriers, here we report the design and synthesis of a new type of high-performance anode material composed of CuO or hybrid MxOy-CuO (M = Zn, Ni, Co, Mn or both of them), which has three unique structural features: (i) 1D porous nanorods with multi-phase intergrowth feature as building blocks, (ii) central cavity originated from the radially aligned nanorods, and (iii) constructed microspheres with low outer surface area. When applied for LIBs anode, 10ZnO-CuO exhibited high capacity retention with 612 mA h g-1 even after 600 cycles. This enhanced lithium storage is closely related to the unique structural features and the generated multi-phase synergistic effect that could facilitate fast electro/ion transport and buffer volume expansion. For example, the in-situ TEM observation confirmed that the central cavity and porous geometry had almost “zero” volume stress, thus being able to effectively accommodate the volume change; the presence of the “Job-sharing” mechanism among multi-phases contributed to the enhanced capacities, etc. This work demonstrates that this strategy is versatile and facile for constructing the 3-order hierarchy structures for various metal oxide systems, and the formed structures have ample applications in various areas.Graphical abstractA 3-order hierarchy structure, in which the porous nanorods are radially assembled into hierarchical porous microspheres with a cavity at the center, was designed and synthesized as high-performance anodes for lithium ion batteries. Abstract: Publication date: February 2019Source: Energy Storage Materials, Volume 17Author(s): Pei Zhu, Chaoyi Yan, Jiadeng Zhu, Jun Zang, Ya Li, Hao Jia, Xia Dong, Zhuang Du, Chunming Zhang, Nianqiang Wu, Mahmut Dirican, Xiangwu Zhang Lithium-sulfur batteries (LSBs) are promising next-generation energy storage system beyond state-of-the-art lithium-ion batteries because of their low cost and high energy density. However, liquid electrolyte-based LSBs suffer from “polysulfide shuttle”, and safety concerns originated from the use of flammable organic electrolytes and the formation of lithium dendrites. Herein, we report a novel bilayer framework through integrating a three-dimensional (3D) carbon nanofiber/sulfur (CNF/S) cathode with one-dimensional (1D) ceramic Li0.33La0.557TiO3 (LLTO) nanofiber-poly(ethylene oxide) (PEO) solid composite electrolyte to serve as both cathode and electrolyte for room-temperature ASSLSBs. The stabilized cycling performance of this novel bilayer structure design lies in the reduced interfacial resistance and enhanced electrode/electrolyte interfacial stability due to the addition of Li+ conducting 1D LLTO nanofibers, as well as the formed fast-continuous electron/ion transportation pathways within the 3D cathode architecture. Meanwhile, the mechanically robust bilayer framework with micro-/meso-pores could also accommodate the large volume change of sulfur during continuous charge-discharge process and help suppress the Li dendrite formation. As a result of the aforementioned benefits of the novel bilayer structure design, the introduced ASSLSBs could deliver a stable cycling performance at room temperature with high Coulombic efficiency of over 99%.Graphical abstractA flexible electrolyte-electrode bi-layer framework was prepared by integrating a three-dimentional carbon nanofiber cathode with one-dimentional ceramic Li0.33La0.557TiO3 nanofiber-poly(ethylene oxide) solid composite electrolyte for room-temperature all-solid-state lithium-sulfur batteries (ASSLSBs). Due to the novel bi-layer structure with reduced interfacial resistance and enhanced interfacial stability, the ASSLSBs can deliver a stable cycling performance at room temperature with high Coulombic efficiency of over 99%. Abstract: Publication date: February 2019Source: Energy Storage Materials, Volume 17Author(s): Zhixiao Liu, Xiong Pu, Fei Gao, Wangyu Hu, Huiqiu Deng Using LiI nanoparticles as the active material is a promising way to improve the performance of the Li-I2 battery. In this study, a first-principles approach is employed to reveal the reaction mechanism of an ultra-small LiI nanoparticle, represented by a Li14I14 cluster, with and without nanoconfined environment. This study is the first time to report that there are polyiodides longer than I5− as intermediate products. For the free Li14I14 cluster, the super-long polyiodides (I11− and I13−) are observed at the deep state of charge (delithiation). However, the super-long chains are converted to a compact I14 cluster at the end of delithiation process. The theoretical open circuit voltage between the I14 and Li14I14 clusters exhibits three plateaus. The highest plateau corresponds to the conversion between the compact I14 cluster and super-long chain-like polyiodides, and the wide medium-voltage plateau is attributed to the transmission between super-long chains and short chains. When the Li14I14 cluster is confined in a (14, 0) single wall carbon nanotube (weight ratio of LiI is 38%), the nanoconfined effect can change the cluster to one-dimensional LiI nanowire. The nanoconfined environment can eliminate the voltage plateau above 3 V, because the nanoconfined effect prohibits the formation of super-long polyiodides and the final charge products are Ix = 2, 3, 5 molecules. Abstract: Publication date: February 2019Source: Energy Storage Materials, Volume 17Author(s): Tugce Ates, Marlou Keller, Jörn Kulisch, Torben Adermann, Stefano Passerini All-solid-state batteries (ASSBs) are promising candidates to significantly exceed the energy densities of today's lithium-ion batteries. However, for their successful commercialization, an easily scalable production procedure is needed. The tape casting procedure herein described allows to process a composite cathode by using an inert (polyoleophine) binder, conductive carbon, β-Li3PS4 and Li1+x[Ni0.6Mn0.2Co0.2]1-xO2. The inorganic electrolyte β-Li3PS4 layer is either coated onto the composite cathode or applied as a self-standing tape. In both cases a pressing step at room temperature is used to remove the porosity. 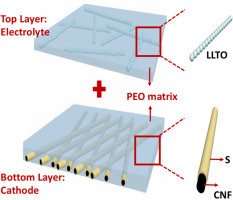 Finally, a polymer electrolyte layer is added prior to the lithium metal anode to avoid the reaction between the latter and the inorganic solid electrolyte. Such dual-electrolyte, solid-state cells demonstrate good cycle performance and specific capacity. The type of conductive carbon in the composite cathode is seen to play a crucial role. Abstract: Publication date: February 2019Source: Energy Storage Materials, Volume 17Author(s): Dawid Pakulski, Adam Gorczyński, Włodzimierz Czepa, Zhaoyang Liu, Luca Ortolani, Vittorio Morandi, Violetta Patroniak, Artur Ciesielski, Paolo Samorì The development of novel materials for enhanced electrochemical energy storage applications, in particular for the fabrication of supercapacitors (SCs) displaying increased properties, is a milestone of both fundamental and technological relevance. Among nanostructured materials, polyoxometalates (POMs) combined with various carbon-based nanostructures represent a very promising class of hybrid systems for energy storage, yet, guidelines for their rational design and synthesis leading to high-performance SCs is still lacking. 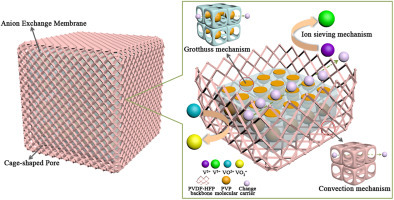 Here, we have produced a novel hybrid architecture based on Keplerate type POM (Mo132) functionalized with dodecyltrimethylammonium bromide (DTAB), which upon mixing with electrochemically exfoliated graphene (EEG) nanosheets results in the formation of porous 3D superstructures. 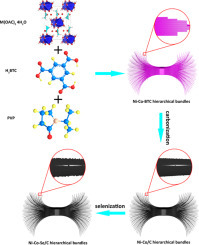 Mo132-DTAB-EEG combines the redox activity of POMs and high electrical conductivity of graphene, all synergically mediated by the surfactant-assisted porosity enhancement, to form new electrode materials for SCs. Cyclic voltammetry and galvanostatic charge/discharge electrochemical studies on Mo132-DTAB-EEG performed in aqueous H2SO4 electrolyte revealed that the unique combination of these three components yields highly efficient energy storage materials. In particular, our highly porous hybrids system exhibits high specific capacitance of 65 F g−1 (93 F cm−3, 93mFcm−2) combined with excellent stability (99% of specific capacitance retained) after 5000 charge/discharge cycles at different current densities, overall displaying significantly improved performance compared to pristine electrochemically exfoliated graphene material. Strong non-covalent interactions between Keplerate type polyoxometalate Mo132-DTAB and graphene surface offer higher stability compared to other hybrid POM/carbon-based systems, and unique electrical properties of the multicomponent structure, thereby paving the way towards the development of novel, and potentially multifunctional, POM-based architectures to be exploited as SC electrode materials. Abstract: Publication date: February 2019Source: Energy Storage Materials, Volume 17Author(s): Huanxin Li, Lanlan Jiang, Qiaoxia Feng, Zhongyuan Huang, Haihui Zhou, Yi Gong, Zhaohui Hou, Wenji Yang, Chaopeng Fu, Yafei Kuang Carbon materials play indispensable roles in energy-related systems, and constructing fast chargeable carbon anodes is still one of the most interesting and meaningful topics in energy storage and conversion fields. Selection of an appropriate structure and quantity of quantum dots can improve the rate performances. Here we report a unique molecular beam template approach to inlay MnO quantum dots (MnOQD) into walls of carbon hetero-nanotubes to form a brand-new composite (MnOQD@CHNTs) and investigate the influences of the inlaid quantum dots on the structures and the fast charging properties of carbon hetero-nanotubes. Plenty of tiny inlaid MnOQD in the walls of carbon nanotubes are proved to be capable of expanding the carbon layer spacing, decreasing the degree of order, forming heterojunctions with carbon, and altering the local electronic cloud density of carbon. Therefore, the capability of MnOQD@CHNTs for Li+/Na+ transfer and storage is greatly improved due to the quantum dot effect of MnO. 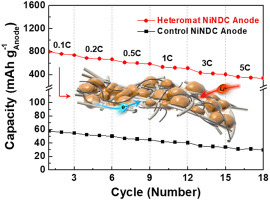 As a result, the MnOQD@CHNTs exhibit excellent cycling and rate performances as both lithium-ion battery (LIB) and sodium-ion battery (SIB) anodes, e.g. fully charged in 28.3 s with a capacity of 392.8 mA h g-1 (~ 125.6 C) in LIB (the best ever reported).Graphical abstractMnO quantum dots inlaid carbon hetero-nanotubes (MnOQD@CHNTs) was prepared by a unique molecular beam template approach. The quantum dot effect of MnO was proved to capable of enhancing the storage and increasing the migration speed of ions significantly, e.g. fully charged in 28.3 s with a capacity of 392.8 mAh g-1 in LIB. Abstract: Publication date: February 2019Source: Energy Storage Materials, Volume 17Author(s): Pengcheng Sun, Jerome Davis, Luoxia Cao, Zhelong Jiang, John B. Cook, Hailong Ning, Jinyun Liu, Sanghyeon Kim, Feifei Fan, Ralph G. Nuzzo, Paul V. Braun 3D structured porous electrodes have been considered as a possible solution for accommodating the volume change of alloying lithium ion battery anode materials during cycling. However, lab-scale porous electrodes tend to be thin, and the loading of the activity materials is also small, the combination of which results in electrodes with impractically low areal and volumetric capacities. Here, we develop a high areal and volumetric capacity 3D-structured Sn/C anode by using a two steps electroplating process. An electrode with a 20%v/v Sn loading exhibits a high volumetric/areal capacity of ∼879 mA h/cm3/6.59 mA h/cm2 after 100 cycles at 0.5 C and a good rate performance of about 750 mA h/cm3 and 5.5 mA h/cm2 (delithiation) at 10 C in a half-cell configuration. The 3D Sn/C anode also shows good compatibility with a commercial LCO cathode in a full cell configuration.Graphical abstractHere we show how a simple two step electroplating process enables synthesis of 75 µm thick 3D structured Sn/carbon anodes with high Sn loadings. The electrode-based volumetric and areal capacity of a 20% v/v Sn loaded scaffolded anode reached 1352 mA h cm−3 and 10.14 mA h cm−2. Enabled by the electrode mesostructure, the structured anode provides an outstanding power performance, delivering up to 750 mA h cm−3 and 5.6 mA h cm−2 at 10 C, which to the best of our knowledge, is the highest rate capability reported for such a high-energy anode. Abstract: Publication date: February 2019Source: Energy Storage Materials, Volume 17Author(s): Changmin Shi, Tianyang Wang, Xiangbiao Liao, Boyu Qie, Pengfei Yang, Meijie Chen, Xue Wang, Arvind Srinivasan, Qian Cheng, Qin Ye, Alex Ceng Li, Xi Chen, Yuan Yang High-performance stretchable batteries are key components for stretchable devices. However, it is challenging to have both high stretchability and high energy density simultaneously. 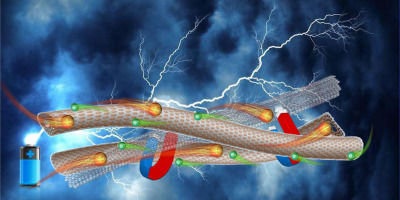 Herein, we report a design of accordion-like stretchable lithium ion batteries, where the rigid energy storage units are connected by wrinkled and stretchable components. Simulation results show that such accordion-like design and the tape/metal/tape sandwiched structure reduces maximum stress of Al foil in the structure from 31.2 MPa to only 17.1 MPa, which significantly enhance the cell stability. Meanwhile, as the volume of rigid segments are larger than the stretchable part, such design can achieve stretchability of 29% while maintaining 77% (233 Wh L−1) of volumetric energy density of that in conventional packing. Experimentally, the cell shows a high capacity retention of 95.4% even after stretching by 22% for 10,000 times, bending for 20,000 times, and 100 cycles at 0.5 C. It also provides steady power output during continuous dynamic mechanical tests. The corresponding average discharge voltage is only reduced by 1 mV. This accordion-like battery provides an alternative strategy to design stretchable batteries for stretchable devices. Abstract: Publication date: February 2019Source: Energy Storage Materials, Volume 17Author(s): Hui Xu, Yunting Liu, Taotao Qiang, Liguang Qin, Jian Chen, Peigen Zhang, Yao Zhang, Wei Zhang, Wubian Tian, Zhengming Sun Cost-effective sodium-ion batteries (SIBs) are the most promising candidate for grid-scale energy storage. However, the lack of suitable high-performance anode materials has hindered their large-scale applications. In this study, we report a multiscale design to optimize a TiO2-based anode from atomic, microstructural, and macrostructural levels. A key point in our design is the use of Co-doped amine-functionalized Ti-MOFs as multi-functional precursors, which not only achieves Co, N double-doping, and encapsulation of ultrafine TiO2 nanoparticles in mesoporous C frameworks, but also endows the precursors with positive surface charges, driving them to combine with graphene nanosheets into a 3D macroporous network architecture by self-assembly. The well-designed anode delivered high reversible capacities of 174 mA h g−1 at 6 C for over 5000 cycles, 121 mA h g−1 at 15 C for over 10,000 cycles, and 100 mA h g−1 at 30 C for over 3000 cycles, demonstrating the most efficient TiO2-based anode ever reported for SIBs. The unprecedented sodium storage performance is attributed to the multiscale integration yielding a high content of oxygen vacancies, 3D continuous conductive networks, and open diffusion channels, promoting both electron conduction and Na+ diffusion not only inside and around the TiO2 nanoparticles but also through overall electrode. The unique multiscale design based on MOF-derived strategy holds great potential in generalizable synthesis of versatile electrode materials for advanced battery systems. Abstract: Publication date: February 2019Source: Energy Storage Materials, Volume 17Author(s): Chenyang Zha, Donghai Wu, Tikai Zhang, Jinghua Wu, Houyang Chen The development of high performance lithium-sulfur batteries is trapped by the shuttle effect of intermediate polysulfides and the insulating nature of sulfur. To overcome these drawbacks, numerous state-of-the-art encapsulation/wrap of sulfur strategies have been developed. However, most of these methods have challenges to implement in commercializing applications of lithium-sulfur batteries. Herein, a facile and effective sulfur loading method is presented by droping liquid Li2S8 into carbon coated TiO2 nanowire arrays without any complex pre-processing. As a result, these electrodes with 2.0 and 4.0 mg/cm2 sulfur have high initial capacities of 1280 and 1240 mAh/g, and maintain 930 and 680 mAh/g after 500 cycles under 3.2 mA, respectively. For a quick-acting cycling, it holds 520 mAh/g after 500 cycles at 5.8 mA with 4.0 mg/cm2 sulfur loading. 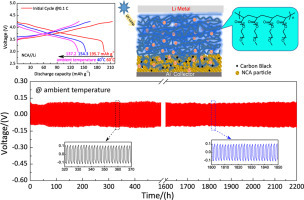 The facile sulfur loading approach may provide a new opportunity to construct high performance sulfur-based cathodes for their industrial applications.Graphical abstractThe liquid Li2S8 directly dropping into carbon coated TiO2 nanowire arrays for better Lithium-sulfur batteries. 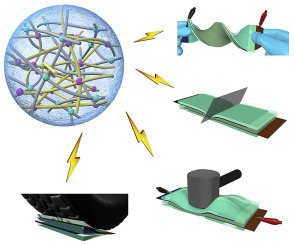 Abstract: Publication date: February 2019Source: Energy Storage Materials, Volume 17Author(s): Zheng Yi, Ning Lin, Yingyue Zhao, Weiwei Wang, Yong Qian, Yongchun Zhu, Yitai Qian Inspired by the carbon nanotubes (CNTs) with high elasticity, we design a flexible conductive Si/CNT composite where the CNTs are in situ grown in the porous Si particles with mesoscale porosity to solve the problems facing high capacity Si-based anodes. The Si/CNT composite with CNTs in situ grown into the Si wall and mesoscale porosity has advantages in several aspects, including improving the electron transport within the Si particle, holding the Si domains together without getting pulverized, and exhibiting excellent mechanical properties. As a result, the as-obtained Si/CNT composites delivers a reversible capacity of 1275.5 mA h g-1 at 0.2 A g-1 after 100 cycles and a capacity of 715.5 mA h g-1 at 1 A g-1 after 400 cycles. When assembled with the Si/CNT composite as anode and commercial LiCoO2 as cathode, the full cell delivers a reversible capacity of 127.4 mA h g−1 with a working potential beyond 3.0 V based on the cathode active material. The enhanced performance could be attributed to the flexible conductive microstructured design, which can significantly improve conductivity, stabilize SEI film, and maintain the integrity of the porous Si-based electrodes. Abstract: Publication date: February 2019Source: Energy Storage Materials, Volume 17Author(s): Hanyan Xu, Tianwen Bai, Hao Chen, Fan Guo, Jiabin Xi, Tieqi Huang, Shengying Cai, Xingyuan Chu, Jun Ling, Weiwei Gao, Zhen Xu, Chao Gao The aluminum-ion battery is a very promising rechargeable battery system for its high-power-density and three-electron-redox aluminum anode. Currently, the aluminum-ion battery is mainly composed of aluminum anode and graphitic cathode, separated by 1-ethyl-3-methylimidazolium chloride (EMIC)-based ionic liquid electrolyte. Despite of the progress made for cathode materials, its practical application is severely restricted by the high cost and low productivity of EMIC. 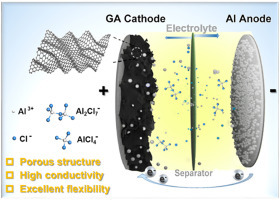 Here we report a low-cost AlCl3/Et3NHCl room temperature ionic liquid electrolyte to fabricate practical yet high-performance Al-graphene battery. The battery shows 112 mAh g-1 cathodic capacity with 97.3% retention after 30,000 cycles and 84% retention even after an ultrahigh current density at 18 A g-1 (150 C, charged in 18 second). In this battery, electrochemical deposition/dissolution of aluminum at the anode while intercalation/de-intercalation of chloroaluminate anions in the graphene cathode take place during charge-discharge. The formation of a stage 3 graphene intercalation compound at fully charged state is confirmed. This pragmatic and cost-effective AlCl3/Et3NHCl room temperature ionic liquid grants the aluminum-ion battery with high performance and higher practical value. Abstract: Publication date: February 2019Source: Energy Storage Materials, Volume 17Author(s): Daohao Li, Guojing Chang, Lu Zong, Pan Xue, Yu Wang, Yanzhi Xia, Chao Lai, Dongjiang Yang ：A sustainable biomass conversion and green strategy, using red algae derived carrageenan-Fe hydrogel as precursor, is developed to fabricate the 3D hierarchical macro-meso-microporous sulfur-doped carbon aerogel (HPSCA) with tunable nanopores and ultra-high surface area up to 4037.0 m2 g−1. 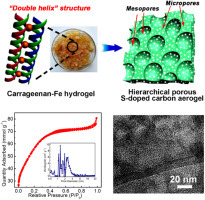 The molecular-level dispersions of Fe3+ ions in carrageenan contribute to the ultra-high surface area of HPSCA after carbonization, acid washing and activation process. The attracting structure features make it an applicable candidate material in lithium-sulfur (Li-S) batteries and double-layer supercapacitors (SCs). The highly developed porous structure of HPSCA can accommodate more sulfur (up to 80 wt%) to produce high-energy composite cathode with high specific capacity, cycle stability and long cycle life (400 cycles) in Li-S batteries. Meanwhile, HPSCA can present high specific capacitance of 335 and 217 F g−1 (1 A g−1) in the aqueous and organic electrolyte. Superior rate performance also can be obtained, and high capacitance of 204 F g−1 at 100 A g−1 and 173 F g−1 at 50 A g−1 in aqueous and organic electrolytes, respectively, is retained.Graphical abstractA sustainable biomass conversion strategy is developed to fabricate hierarchical porous sulfur-doped carbon aerogel with ultra-high surface area up to 4037.0 m2 g−1 for energy storage applications. Abstract: Publication date: Available online 1 February 2019Source: Energy Storage MaterialsAuthor(s): Jinqiu Zhou, Haoqing Ji, Jie Liu, Tao Qian, Chenglin Yan Solid-state lithium battery is regarded as high safety and high energy density next-generation energy storage device, but its poor lithium ionic conductivity severely limits its practical application. To address above issues, we report a new super-high ionic conductive gel polymer (SHGP) electrolyte (2.2 × 10–3 S cm–1 at 60 °C and 0.75 × 10–3 S cm–1 at 30 °C), which are significant characteristics for greatly improved quasi-solid-state lithium sulfur battery performance. Moreover, the SHGP electrolyte exhibited strong adsorptivity to lithium polysulfides as the polar functional groups in the SHGP electrolyte through chemical adsorption, leading to the suppressed shuttle effect, which was theoretically confirmed by density functional theory (DFT) calculations, molecular dynamics (MD) simulations and experimentally verified by in-situ UV/Vis results. 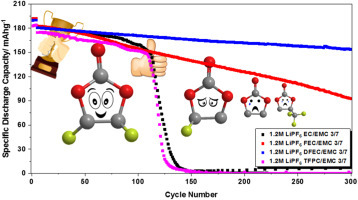 Such high ionic polymer electrolyte enables a greatly improved specific capacity of 950 mAh g−1 at 0.2 C and outstanding cycling performance for 400 cycles at 1.5 C, which is far beyond that of conventional poly (ethylene oxide) based quasi-solid-state battery.Graphical abstractWe report a new super-high ionic conductive gel polymer (SHGP) electrolyte (2.2 × 10–3 S cm–1 at 60 °C and 0.75 × 10–3 S cm–1 at 30 °C), which are significant characteristics for greatly improved quasi-solid-state lithium sulfur battery performance. Moreover, benefited from the strong interaction between lithium polysulfide and the nitrogen donor atoms in amino groups of SHGP, lithium polysulfide molecules are preferentially immobilized rightly on the surface of SHGP contacted with sulfur cathode rather than diffuse in the electrolyte, which could be theoretically confirmed by DFT calculations and MD simulations. Abstract: Publication date: February 2019Source: Energy Storage Materials, Volume 17Author(s): Jie Yang, Yun Yang, Anran Li, Zicheng Wang, Hua Wang, Dandan Yu, Pengfei Hu, Mengmeng Qian, Jie Lin, Lin Guo Currently, energy scarcity and environmental pollution are two severe challenges facing humanity. On one hand, significant efforts are being devoted to the development of sustainable, cheap, high-performance rechargeable battery cathodes. On the other hand, organic dyes are one of main contaminating components in plant effluents, damaging the ecological balance of surrounding areas as well as wasting a lot of valuable chemical raw materials. In this study, we rationally designed a strategy to simultaneously address these two issues. After carefully studying the chemical structure of dye molecules, we find that two types of widely-used dyes including phenothiazine dyes and anthraquinone derivatives with intrinsic redox centers can be effectively decolorized by adsorption removal with mesoporous carbon and directly resource-utilized for lithium-ion battery electrode materials. For example, the composite based on mesoporous carbon hosting methylene blue dye achieves an outstanding specific capacity of 107 mAh g-1 even at a high current of 3 A g-1 and long-term cycling stability with 82% initial capacity retention after 1000 cycles, which is comparable to the classic LiFePO4 material, and superior to many recently-reported organic cathode materials. Our strategy therefore “kills two birds with one stone”, enabling the development of high-performance battery cathodes based on organic dyes in combination with effective valorization of dye-containing wastewaters.Graphical abstractNovel cathode materials for rechargeable batteries can be fabricated by the adsorption removal of two types of widely-used organic dye wastewater with mesoporous carbon. The dye-based batteries exhibit high specific capacities, exceptionally high-rate and long-cycle-life electrochemical performance. Our work provides some new insights for the sustainable treatment and resource-utilization of dye wastewater. Abstract: Publication date: February 2019Source: Energy Storage Materials, Volume 17Author(s): Qi Liu, Arthur Cresce, Marshall Schroeder, Kang Xu, Daobin Mu, Borong Wu, Lili Shi, Feng Wu While the solid-electrolyte-interphase (SEI) originating from carbonate-based electrolytes has been extensively studied due to the success of Li-ion batteries, significantly less is known about the SEI formed in ether-based electrolytes, which have become increasingly important for many “beyond-Li ion” batteries, including lithium-sulfur and other lithium metal battery systems. 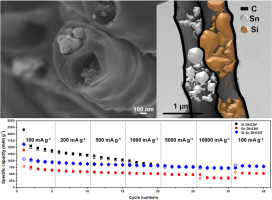 Li dendrite growth and poor cycling efficiencies related to high rate and/or high capacity cycling of lithium are two of the primary factors limiting practical application of Li metal anodes. Similar to graphite in Li-ion batteries, these behaviors are inextricably linked to the mechanism for SEI formation, the resulting interphase chemistry, and the film stability during cycling—all of which require further understanding. Employing both computational and experimental means in this effort, we investigated the reduction chemistry of dimethoxyethane (DME) and 1,3-dioxolane (DOL) on the surface of metallic lithium. We determined that ether-based SEIs are layer-structured, with an outer organic/polymeric layer consisting of lithium oligoethoxides with C-C-O or O-C-O linkages and an inner layer of simple inorganic oxides (Li2O). Remarkably, although Li+ is preferentially solvated by DME, it is the cyclic DOL that primarily contributes to the interphase chemistry. 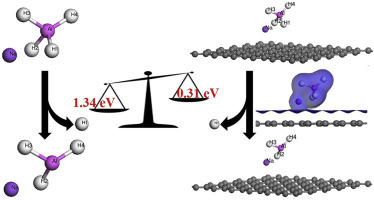 This selective electrochemical reduction of ether solvents is corroborated by precise calculation of transition state structures and energies, providing a valuable guide for future design and manipulation of Li anode interphasial chemistries. Abstract: Publication date: Available online 31 January 2019Source: Energy Storage MaterialsAuthor(s): Zhongchen Zhao, Zhengqiang Hu, Ruishun Jiao, Zhanhong Tang, Peng Dong, Yadong Li, Shandong Li, Hongsen Li The development of new rechargeable metal-ion (Na+, K+ or Al3+) batteries (MIBs) with high performance would break the global monopoly on lithium-ion batteries (LIBs). However, because of the larger ionic sizes of Na+, K+ and Al3+ in comparison to Li+, the requirement of electrode materials with suitable tunnels for these metal ions insertion/extraction is more stringent. Over years, a large number of electrodes materials are studied and optimized for a specific type of MIB, yet a universal suitable candidate that can be applied for all of them still remains scarce. Here we report a solvothermal method coupled with the sulfidation strategy to engineer novel multi-layer architecture of FeS2@C hybrids which is constructed from building blocks of ultrathin nanoflakes, favoring fast electrochemical energy storage. Electrochemical measurements show that the multi-layer structured FeS2@C hybrids enables reversible sodium-, potassium- and aluminum-ion storage process with high specific capacities, excellent rate capability and outstanding cycling stability. We hope that this research will inspire new ideas for developing various electrode materials for high-performance MIBs.Graphical abstractMulti-layer architecture of FeS2@C with ultrathin nanoflakes is synthesized by a solvothermal method coupled with the sulfidation strategy, which exhibits excellent electrochemical performance for sodium-, potassium- and aluminum-ion batteries. Abstract: Publication date: Available online 29 January 2019Source: Energy Storage MaterialsAuthor(s): Daliang Han, Zhe Weng, Pei Li, Ying Tao, Changjun Cui, Lina Zhang, Wenna Lin, Yang Gao, Debin Kong, Quan-Hong Yang For lithium-ion capacitors (LICs), the electrode mass balancing and the electrode potential tuning are two techniques that have been widely used to maximize the gravimetric specific capacity and voltage to achieve a maximum gravimetric energy density. However, it is also great important to consider the volumetric performances of energy storage devices for the compact and portable applications. Herein, for achieving high-volumetric-performance LICs, we propose an electrode thickness matching strategy, which is to minimize the thickness of thick cathodes as close to the one of thin anodes as possible via increasing the gravimetric specific capacity and density of cathode materials. It is demonstrated that introducing a highly dense but porous activated carbon/graphene (AC/G) composite rather than the low-density traditional activated carbon as the cathode material, the volumetric energy density of the assembled AC/G//graphite LIC can be increased by 62% to reach a maximum of 98 Wh L-1, which represents one of the highest records for the contemporary LICs. We believe that the thickness matching should be a universal strategy for achieving high volumetric performances and can be applicable to other electrochemical energy storage devices.Graphical abstractThe thickness reduced cathode can remarkably improve the volumetric energy density of the assembled lithium-ion capacitor by 62%.